Wynn, Graeme. "Timber Axe". The Canadian Encyclopedia, 04 March 2015, Historica Canada. https://www.thecanadianencyclopedia.ca/en/article/timber-axe. Accessed 20 April 2019. 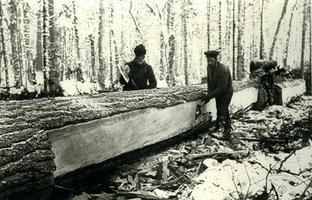 Loggers squaring a pine at Jocko River, Ontario, 1890 (courtesy Public Archives of Ontario). Two basic types of axe were used in the early 19th-century eastern forest industry. The more common poll axe had a single, fan-shaped cutting edge, a narrow head weighing 1.5-2.5 kg, and a hickory or maple handle. It was used for felling, scoring and lopping branches off fallen trees. The large, distinctive broadaxe was used for hewing masts and square timber. Its 5 kg, 25 cm wide bevelled blade resembled a large chisel. The hewer cut down diagonally across the grain of the roughly squared baulk to leave a smooth, even surface. On the West Coast, larger double-bitted axes were used. Their narrow 25 cm blades and long handles were designed to fell the enormous trees of the Pacific slope. Smaller double-bitted axes were used in eastern pulpwood operations; they were also common in the square timber trade. One bit was used for felling and the other for clearing out stumps and roots on skid roads. 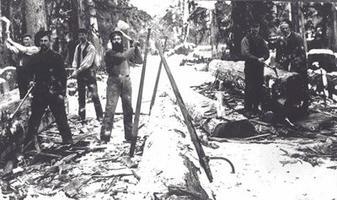 By the late 19th century the crosscut saw had largely replaced the axe for felling trees.